NFC payment is brought to a new level. With iBonus® NFC Payment Terminal, you can use your NFC-ready phone or tablet as a terminal to deploy your own loyalty programs. 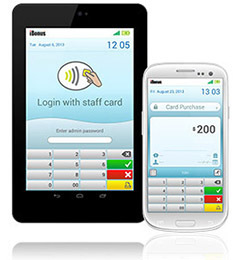 iBonus® NFC Payment Terminal is an Android based application which performs smart card payment and bonus point transactions. Its intuitive user interface design facilitates staff to perform member card and card management transactions easily with their fingertips. With the mobility gained from the 3G and WIFI connection of the mobile device, your Android device can carry out transaction anywhere.